This week, Comedy Central's roast of Rob Lowe made headlines for ruthless treatment of one of its roasters, infamous right-wing political commentator Ann Coulter. Comedian Andy Kindler weighs in on Coulter's inability to take a joke, the right way to roast someone and why sometimes civilians should stay off the comedic battlefield. Pundit Ann Coulter, author of If Democrats Had Any Brains, They'd Be Republicans and Adios, America: The Left's Plan to Turn Our Country into a Third World Hellhole recently ventured beyond the bubble of political analysis and into the broadly antagonistic world of celebrity roasts. It was supposed to be a roast of Rob Lowe, but at the Comedy Central event, the vitriol of professional comedians like Jeff Ross, Nikki Glaser and Jimmy Carr veered away from Lowe and locked onto Coulter, as though she'd been laser painted with an infra-red target. Here's some of what Coulter and the audience of Monday night's broadcast endured. Pete Davidson: "Ann Coulter if you're here, who's scaring crows away from our crops!?" Nikki Glaser: "The only person you will ever make happy is the Mexican that digs your grave. " David Spade: "Ann seems stiff and conservative, but she gets wild in the sheets — just ask the Klan." Coulter later blasted Comedy Central and the other participants at the roast, but it was clear to anyone watching the event she wasn't enjoying it. Why would she? The attacks were personal and vicious with several jokesters imagining her dead and many barbs about her personal appearance, comparing her to a scarecrow, a horse and a truck stop transvestite. So was Coulter treated unfairly? Did the jokes fall outside what's generally acceptable at a celebrity roast? "I probably would not tell someone to kill themselves," comedian Andy Kindler told me on CBC Day 6. But Andy says merely including Coulter in a roast is fraught because it suggests a mainstreaming of her politics. "To me", he says,"It's unconscionable. It is unethical that somebody like Donald Trump was ever roasted by Comedy Central because it legitimized them." "And you know, I don't even like jokes about people's appearance. It doesn't make me laugh normally," Kindler added. "But she's such a terrible human being that I don't really care what they say about her." The fact that Coulter is a polarizing figure does push against the show biz tradition of the roast. "Roasts used to be a group of people who generally knew each other," Kindler recalls. "I mean the old Dean Martin roast, The Friars Club, they were based upon the premise that these were all people who, on some level, did like each other." The Friars Club claims to have originated the celebrity roast over a century ago. Their motto - "We only roast the ones we love!" - reminds participants that all insults, no matter how harsh, are rooted in respect and affection. The honour attached to the roast is real, and it was clearly never intended to be used as a tool to promote a book. Coulter has said she attended the Comedy Central event to push her book, and has only a slight acquaintance with Rob Lowe. 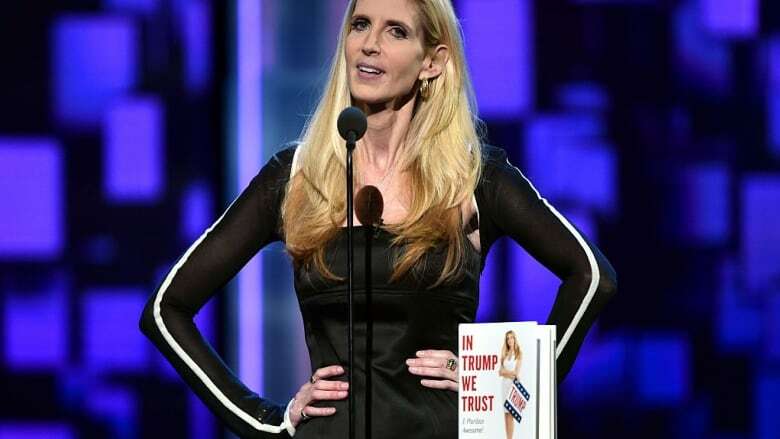 Coulter's latest book is called In Trump We Trust and Andy says until November, Coulter should be seen as a surrogate for the Republican candidate. "She is representing him wherever she goes", he says. "I don't care if it's a restaurant or ... wherever she goes, between now and November. I hope the people of the restaurant that she goes to, they organize a roast." "Because I think that's where the anger rightly is coming from and that's where the catharsis is actually amazing. And it goes beyond what roasts are."